My partner and I have stayed in places in the past that have not been up to our standards. We saw great smoky cabin rentals on the Internet and decided to give them a try. We went to the rental office in person to see if we could get some help finding a cabin that fit our needs. The wonderful lady that helped us found the most amazing little cabin for us to stay in.. (The bearhug). She was very helpful, very friendly, and had a great sense of humor!!! I give her a lot of credit for making our stay so enjoyable. The place was clean, great location, and well taken care of. It had all the amenities needed for a nice day out in the country. We could have easily have gone to another company had it not been for the helpful person that was persistent in helping us find a lovely, romantic (AND affordable) place. To visit the great Smoky Mountains. I have always wanted to visit the area and The little bear hug cabin was the icing on the cake. Excellent customer service! I have rented many cabins in the past but never had the rental agency call me on the day of check in to make sure everything was acceptable. We were very impressed. My son is a freshman at WCU and it was family weekend. I was very pleased and plan to come again but for a longer stay. Team members were very nice and helpful! Property was great! Awesome and far out! I would love to come back to stay longer. The view was great. I wanted to show my sister who is still here visiting from Oregon the smoky mountain. We received the direction and information on the cabin in a timely manner. We loved the view from this property. We did not like the road condition to this property. We couldn't have asked for a nicer cabins. My boyfriend and I came to celebrate my 61st birthday! WE had a great time. The cabin is beautiful and has everything that you need! Very nice cabin with beautiful long range mountain views. We have stayed in a number of cabins in the TN mountains and this one beats those hands down. Needed 4 bedrooms in a secluded setting that was nicely furnished and this one fit our needs. Kelli was GREAT!!!! Enjoyed the property and atmosphere. Beautiful cabin and wonderful time with my family. Your customer service representative - Kelly - was wonderful. I chose it because she sent me information immediately and followed up with a phone call. Your staff was very helpful. I love that they were there if we needed them but didn't invade on our visit. The reminders were just perfect. Found your cabin online searching and once we saw it, we loved it. We stopped searching as it had everything we were looking for. The cabin exceeded our expectations in person. Very good support and everyone very friendly. All done by email, very efficient and timely. A much-needed getaway where we were able to relax as we had hoped. The view is what we chose the house for and we were rewarded each morning and evening. We spent hours on the porch watching the puffy drifting morning clouds, the late afternoon storm clouds and the evening stars. Wonderful cabin and great location. We were so close to all the places we wanted to visit and could come back to a beautiful cozy cabin. What a really great view from the upper deck. We would definitely come here again. Wonderful Cabin and great location. We were so close to all of the places we wanted to visit and could come back to a beautiful cozy cabin. What a really great view from the upper deck. We would definitely come here again. 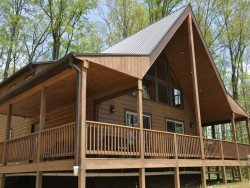 My fiance and I booked this cabin as our first real vacation together. AS soon as we walked in our mouths dropped. We couldn't believe how beautiful the cabin was and nicely decorated it was. It had everything that we needed. You must go to Anthony's Pizza in Bryson City. Really nice people all over this area. It is nice to know that we have found our paradise. We will be back to experience the colder weather. They were kind, friendly, and responding back to matters immediately. We absolutely loved it. We definitely will be coming back! It was so peaceful. The cabin was available for Labor Day Weekend-very easy to find on Google.